Lily wanted me to design a customised invitation for her Bat Mitzvah, just as I had done for her brother Ariel back in 2015. 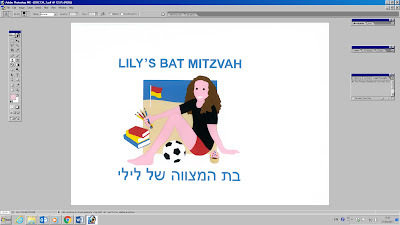 Mum asked for the same format as her son's invitations, with a background box and the lettering, this time saying Lily's Bat Mitzvah at the top and then once again in Hebrew at the bottom. She sent me a list of her daughter's interests which included soccer, art, swimming, the beach, reading and baking. She also suggested that I show Lily wearing a T-shirt and shorts, and was keen for me to highlight her gorgeous curly brown hair too. I have shown Lily sitting down, with a blue sky and sandy beach in the background. There is a red and yellow beach flag in the sand. In Australia, this shows the supervised area of the beach and that a lifesaving service is operating. If there are no red and yellow flags, you should not go swimming. Lily is wearing a black T-shirt and red shorts. 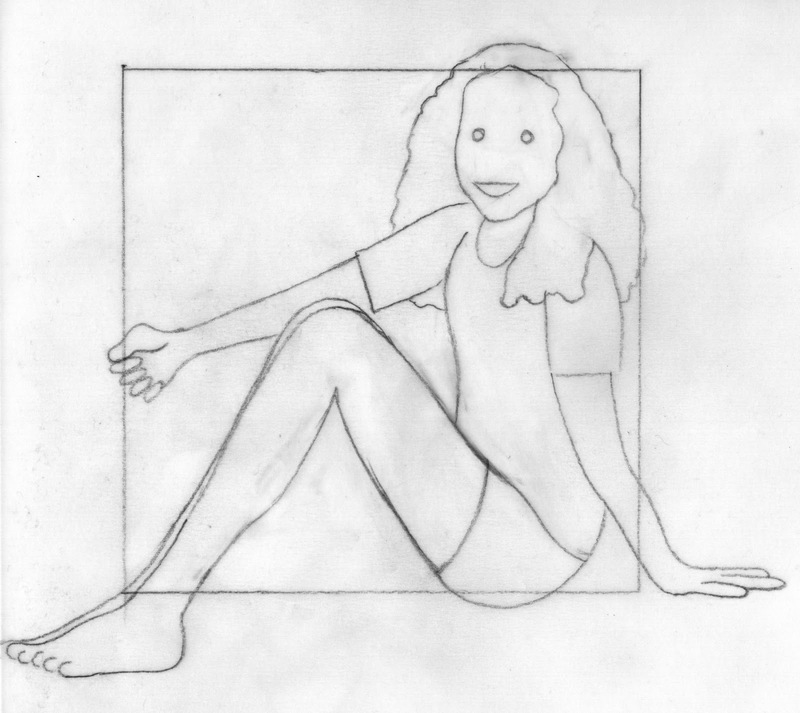 She has a bunch of pencils and a paintbrush to represent her interest in art in her right hand. In front of her is a black and white football, and next to her a small pile of books. I also added a little iced cupcake covered in hundreds and thousands to illustrate her love of baking. Lily was going to have an an ice skating party as part of her Bat Mitzvah celebrations, so Mum asked me if I could create a little penguin to add to the corner of the text as well. "The penguin is adorable!" she wrote to me. I think he, or she, might have even been more popular than Lily's paper portrait! * This post has been shared on Artsy-Fartsy, Little Things Thursday, Share Your Cup Thursday, No Rules Weekend Blog Party, The Creative Circle, Welcome to the Weekend and Seasons. What a lovely card! What a great invitation card! I really love it. Kisses, my friend. Yes, there are some images that everyone adores! The first that struck me about different about your card that you included her hair in the top edge of the card. I like that very much It's that little item that sets your card apart! Keep forging on Lisa! Who know you will once have a retrospect like Dan Reisinger in the future! Many thanks from All Seasons and have a beautiful week! Wow... An interesting Post, I enjoyed reading for Image-In-Ing on Tuesday.